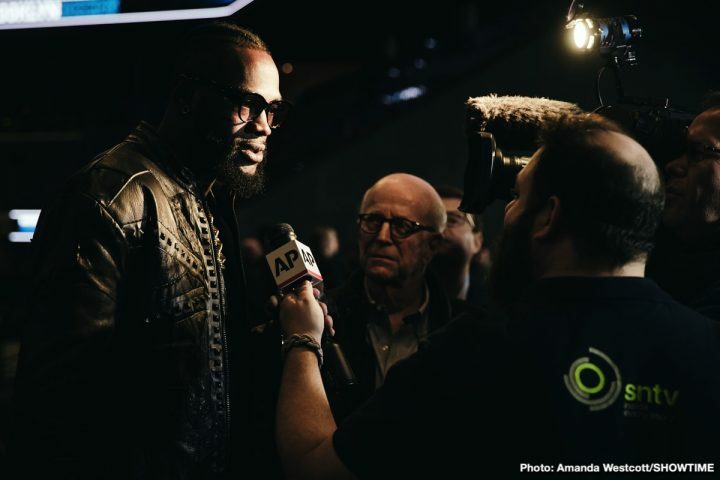 By Tim Royner: Deontay Wilder has ruled out a fight for the undisputed championship at heavyweight against Anthony Joshua in 2019. Wilder told CBS on Saturday that he’ll be fighting Joshua (22-0, 21 KOs) in 2020. Joshua’s promoter Eddie Hearn won’t like the news, of course, because he’s been banging the drum for the Joshua-Wilder contest to take place in November. Hearn has been complaining recently that if the Wilder doesn’t place in 2019, Joshua will be stuck fighting mandatory challengers one after another in 2020. It’s believed that Hearn has the ability to make the Joshua-Wilder fight in 2019 if he tells Team Wilder the words they want to hear: ‘We’ll give you the 50-50 purse split that you’re asking for.’ Since that’s not something that Hearn is likely to do, the unification between Wilder and Joshua will kicked down the road to 2020, and perhaps into 2021. If Wilder beats Fury in the first quarter of 2020, he’s going to be in the position to not only demand the 50-50 split for the Joshua fight, but also expect to get it. Wilder will have a busy year in 2020, because that’s when his rematch with Tyson Fury is supposed to take place in the first quarter of the year. If Wilder beats Fury in February or March 2020, then the Joshua fight will likely be the next one that comes after. With the amount of fan interest in the Wilder-Fury fight, it would be hard for them not to put together a trilogy fight right away. The only thing that would stop that from happening is Fury’s co-promoters at Top Rank. They might decide to let the fight marinate once again, and have Fury fighting more guys along the same lines as Tom Schwarz. The good news is Hearn says he’ll still want to make the Joshua-Wilder fight if one or both fighters lose in the near future. Hearn sees the fight as big enough still for it to happen regardless. The only thing that will change is the purse split. Right now, Hearn is offering Wilder a 60-40 split. If Wilder loses his next fight against Dominic Breazeale on May 18, then Hearn can drop that split to somewhere along the lies of 70-30 or 75-25. If Wilder (40-0-1, 39 KOs) unification fight doesn’t happen in November, Joshua will be under pressure from the International Boxing Federation to defend against his mandatory Kubrat Pulev. That’s a fight that brings nothing to the table for Joshua, and Hearn has said that he could start vacating titles. With WBC heavyweight champion Wilder saying the fight with Joshua won’t be happening this year, it’s going to make a lot of boxing fans believe that he’s ducking the fight. Up until now, the perception from fans is Joshua and his promoter Eddie Hearn have been the ones that have been dragging their feet about making the fight with Wilder happen. Joshua turned down a $50 million offer, and Hearn has been offering Wilder flat fees that are nowhere near what the fight would actually make. Some fans will now look at Wilder as the obstacle to making the unification fight with Joshua happen. Joshua and Wilder need to win their next fights before they can seriously talk about eventually putting a fight together in 2020. Joshua, 29, is facing a tough opponent in unbeaten Jarrell “Big Baby” Miller (23-0-1, 20 KOs) on June 1 on DAZN at Madison Square Garden in New York. The bettors have Joshua installed as a big favorite, but this is a fight that he could lose. Joshua isn’t fighting at home in Great Britain for the first time in his six-year pro career, so he’s not going to have his fans there to motivate him if things start going badly for him. Moreover, Joshua is fighting a big heavyweight with a high punch rate that you would normally see from a well conditioned welterweight. Miller is capable of throwing nonstop punches for an entire 12 round fight. The 315 pound Miller isn’t the biggest puncher in the division, but he hits hard enough for him to be a problem for Joshua simply because of his high punch rate. If Joshua gets tired against Miller, he’s going to have some problems unless there’s a referee working the fight like the one that worked the Joshua vs. Joseph Parker contest last year in March 2018. That referee kept Parker from fighting on the inside, as he pulled him off of Joshua the entire night, forcing the contest to be fought from long range. Hearn is trying to force Wilder to take the fight with Joshua by asking the World Boxing Council to order Wilder to defend against #1 WBC Dillian Whyte in his next fight after his May 18 title defense against Mandatory challenger Dominic Breazeale. However, it doesn’t look like the WBC plan on helping Hearn out, as they’re expected to order Whyte to face Luis Ortiz in a final eliminator. If Whyte takes that fight, he could lose. If he rejects it, which is very likely, then he won’t get a title shot against Wilder, and he’ll have to go in another direction with his career. What Hearn’s real goal is to put Wilder in a position where he’ll be pressured to take the Joshua fight in order to avoid a potentially tough title defense against Whyte (25-1, 18 KOs). If Wilder takes the fight with Whyte, anything possible in that match. Wilder could lose, and then he can forget about the 50-50 purse split that he’s been demanding for a unification fight against Joshua. Hearn likely doesn’t want Wilder to face Whyte in reality. This is more about Hearn trying to force Wilder to take the Joshua fight. Whyte would be someone that Wilder would veer away from in order to take the bigger money match against Joshua. If Wilder and Joshua put off their fight for much longer, one or both of them will lose. Both are flawed, and could be beaten at any time. Wilder’s next fight against Breazeale (20-1, 18 KOs) on May 18 is a risky one, as the 6’7″ challenger has the size, power and heart to win. Wilder has mostly been fighting shorter guys than himself during his career. Breazeale has got the size to reach Wilder, and he hits more than hard enough to KO him if he can land his best shots.